Remember plasmas, the phase of matter where atoms are ripped apart into electrons and nuclei? Plasmas are primed for strong electromagnetic interactions with the world around them, because of all the loose charged particles. They can be used to etch down into surfaces and catalyze chemical reactions, though the ions in a plasma won’t necessarily react with every form of matter they come across. And you can actually use an electromagnetic field on its own to contain a plasma, because of the plasma’s sensitivity to electromagnetic force. The most common design for a fusion reactor, the tokamak, uses a doughnut-shaped field to contain a plasma. That’s how plasmas work at the macroscale, but it’s the individual charged ions in the plasma which react to electromagnetic force. Their interactions sum to a larger observable phenomena, which emerges from nanoscale interactions. But interestingly, the collective interactions of these ions can actually be approximated as discrete entities, called quasiparticles. We’ve talked about quasiparticles before, when we talked about holes which are quasiparticles defined by the absence of an electron. But in plasmas, the collective motion of the ions can also be considered as a quasiparticle, called a plasmon. Each individual ion is responding to its local electromagnetic field, but the plasmon is what we see at a larger scale when everything appears to be responding in unison. A plasmon isn’t actually a particle, just a convenient way to think about collective phenomena. Plasmons can be excited by an external electromagnetic stimulus, such as light. And actually, anyone who has looked up at a stained glass window has witnessed plasmonic absorption of light! Adding small amounts of an impurity like gold to glass results in a mixture of phases, with tiny gold nanoparticles effectively suspended in the amorphous silica that makes up glass. Gold, like many metals, has a high electron density, and the electrons effectively comprise a plasma within each nanoparticle. When light shines through the colored glass, some wavelengths are plasmonically absorbed and others pass through. Adding a different metal to the glass can change the color, and so can different preparations of the glass that modify the size of the included nanoparticles. So all the colors in the window shown below are due to differing nanoparticles that plasmonically absorb light as it passes through! Now you might ask, what determines which wavelengths of light pass through and which don’t? 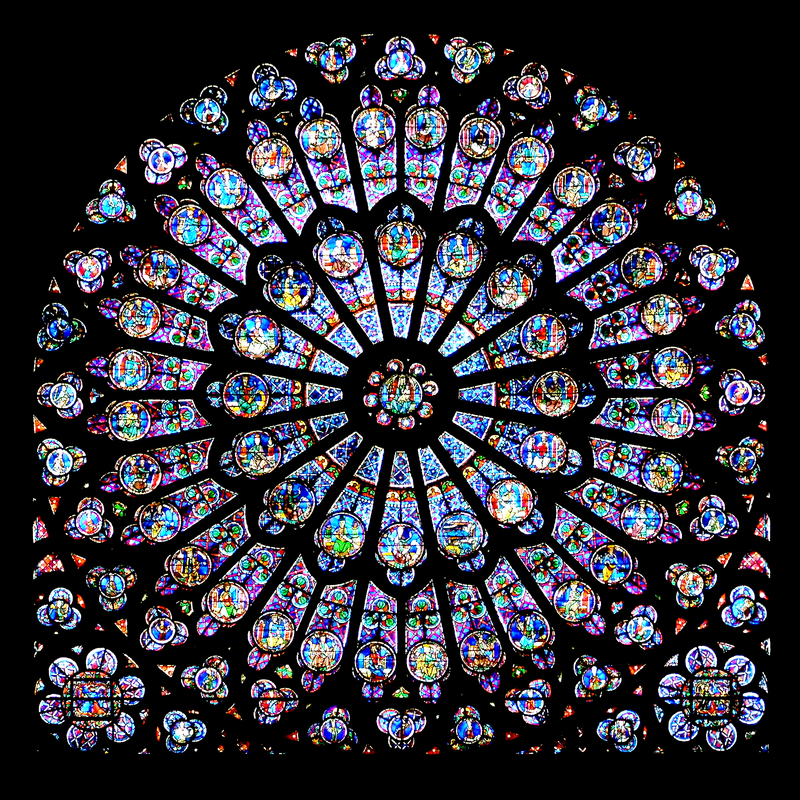 In the case of stained glass, it has to do with the size of the nanoparticles and the metal. But more generally, plasmas have a characteristic frequency at which they oscillate most easily, called the plasma frequency. The plasma frequency depends on several fundamental physical constants, including the mass and charge of an electron, but notably it also depends on the density of electrons in the plasma. For nanoparticles, the size of the particle also affects the response frequency. The practical upshot of the plasma frequency, though, is that if incident light has a frequency higher than the plasma frequency, the electrons in the plasma can’t respond fast enough to couple to the light, and it passes through the material. So the material properties that dictate the plasma frequency also determine whether light will be absorbed or transmitted. For most metals that aren’t nanoscale, the plasma frequency is somewhere in the ultraviolet range of the electromagnetic spectrum. Thus, incident visible light is reflected by the free electron plasma in the metal, right at the surface of the material. And that’s why metals appear shiny!